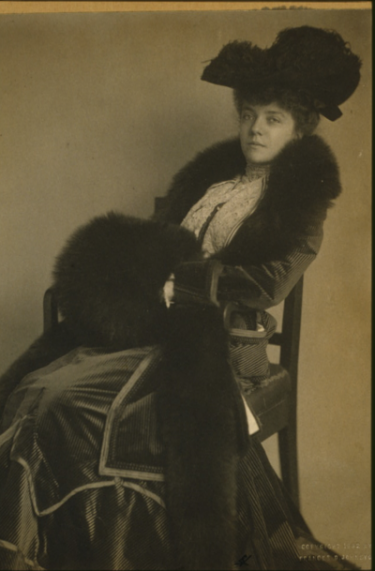 Alice Roosevelt, the eldest child of Theodore Roosevelt, was a force of nature. She was a rebellious child, who turned into a rebellious teenager, who became a rebellious woman. Alice lived nearly a full century (1884-1980) and she was a presence in Washington, D.C. Politicians called her “the other Washington monument”, and there was something to it. Alice went to the White House during every administration after her father’s. A visit from her conferred some sort of extra legitimacy upon any politician. She was a reminder of a grander time, before World Wars, and the Great Depression. Alice was unpredictable in most ways, except one: she was always on the cutting edge of fashion. Johnston, Frances Benjamin. Alice Roosevelt Longworth, ca. 1890. Alice (center) with her father and stepmother, Edith, in 1900 at Cambridge. Alice frequently rebelled against her father and step-mother. Her relationship with Edith, who never overcame her bitterness about Theodore’s first marriage, was often rocky. Alice’s wedding to Rep. Nicholas Longworth in 1906 was the event of the season. The press was fascinated with the details and “Princess Alice” photography was ubiquitous in the early months of 1906. Alice Roosevelt Longworth, three-quarter length portrait, wearing hat and muff, standing at window, facing front ca. 1906. Feb. 8. Johnston, Frances Benjamin. Alice Roosevelt Longworth. Alice, however, reflected later in life that she enjoyed her step-mother very much. Alice (right) spotted leaving a Chicago hospital in 1912 after visiting her father, after a would-be assassin shot the former president. Read about Theodore Roosevelt’s near-assassination here. It was rumored – and never denied by Alice – that Longworth was not Paulina’s father. The Longworths’ marriage was at times contentious, and neither troubled to hide their philandering much from one another.